The days of burning or copying data to a removable drive are over. Thanks to cloud storage services, you can access your files on any computer, without transporting them on a removable drive. SugarSync allows you to upload and share your data as fast and easy as possible. Instead of looking for an Upload option and browsing for one or more files, you just need to click and drag your folders and the application will do the rest. SugarSync can be installed in a few minutes on Windows XP, Vista, Windows 7 and Windows 8, as well as various Mac OS X versions. Furthermore, it is available as an app for mobile phones. After installing the application, you must create an online account, which takes about a minute. You will have 5 GB of free storage space and if you want more, you must pay a monthly fee. 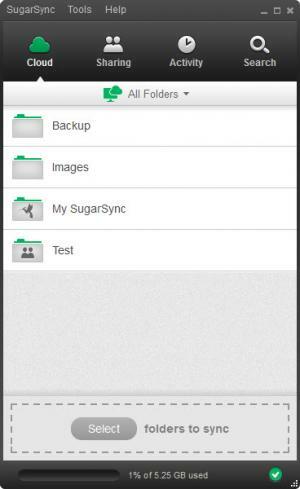 In terms of functionality, SugarSync is a bit similar to DropBox, but it provides a desktop interface, which displays your synchronized folders, contacts, shared data and more. You may click an option, in the lower region of the interface, and select a folder on a separate window, to synchronize it, but a faster way is to drag and drop the folder, in the same region of the interface. The best part is that you don't have to copy your data if you wish to synchronize it. The software will leave the folders where they are and it will mark them with a green check mark. You can still find your synchronized folders in a single location. Besides displaying the folders in a list, the application will create a virtual partition, on which you can find your synchronized data. You can also access the uploaded files, on a web browser, with your online account. Clicking a selected folder, on the user interface, will reveal a series of options for opening the folder in Windows Explorer, sharing it, adding labels, managing its sub-folders, or removing the folder from the cloud. Besides that, each folder comes with an On/Off switch, which can be used to start or stop synchronizing its contents at any time. This feature is particularly useful if you install the application on multiple computers and associate them with the same account, because you have full control to decide what data can be synchronized and where. Sharing folders with contacts is also easy. You can add contacts to a list, on the same interface, but in a different section. To share a folder, you just need to drag and drop it over a contact and decide how to share it. You can opt for private sharing, if you want to control how to view or edit your files or create a public link if you wish to share your data with anyone. It is also possible to set up reading and writing permissions or stop synchronizing shared data. You can store folders on a cloud server, with simple click and drag actions. Besides that, there is no need to copy your data to a specific location. You can share folders with individual contacts and set up permissions. The software allows you to start and stop synchronizing individual folders, with a single click. There are no serious disadvantages to mention.